LOS ANGELES, May 9, 2018 /PRNewswire/ — Cristiano Ronaldo, the world’s leading athlete, announced his partnership today with Graphic India, a leading graphic novel and animation producer focused on creating global superheroes, and VMS Communications, a mobile digital marketing and content management company, to create and launch a new character entertainment property, STRIKER FORCE 7, across animation, comics, publishing, gaming and digital content. The deal was put together by leading sports agency Polaris Sports. “Cristiano Ronaldo has inspired millions of people around the world with his dedication, work-ethic and all-around epic game playing. 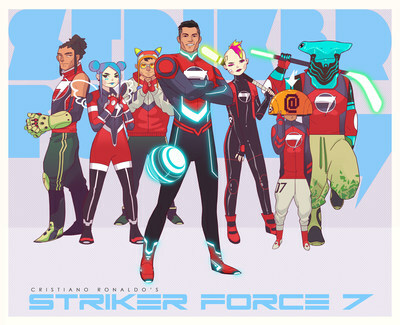 CR7 is a real-life superhero to a generation and Striker Force 7 will bring together a global team of characters from our world (and others), that are representative of the diversity and coolness of his millions of fans,” added Sharad Devarajan, co-creator and producer of the new series and CEO of Graphic India. “We have been working with Cristiano & Polaris Sports for over five years and we can’t ask for better partners. Cristiano ‘s name is synonymous with professionalism, dedication and success. That’s the reason that he inspires millions of people around the globe. He didn’t become the most followed athlete on social media by chance; so developing an animated series of a true icon like Cristiano was a no-brainer for us,” commented Diego Guarderas, COO of VMS Communications. The animated series was created by Cristiano and Devarajan, who will be Executive Producers on the series along with Diego Guarderas of VMS Communications, Polaris Sports team and Jeevan J. Kang, Graphic’s EVP Creative and also the lead character designer.